Ultramarine Green is a weak bluish green with low tinting strength. It is a variation of Ultramarine Blue, and the two pigments share similarities in composition and how they are manufactured. 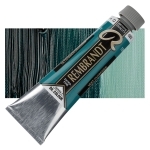 Ultramarine Green has very good permanence, similar to that of Ultramarine Blue. Ultramarine Green has no significant hazards. The name for this pigment comes from the Middle Latin ultra , meaning beyond , and mare , meaning sea , because it was imported from Asia to Europe by sea. It was introduced in Germany in 1828, but it never became popular. However, it was manufactured until 1960. It can still be found through pigment specialists or as part of low-cost oil colors or watercolors.